Solid two story in friendly Verona neighborhood seeks new family. Must be willing to grill on the back deck, invite friends over for dinner, hang out in the big kitchen (with stainless steel appliances, tons of counter space and cabinets), play pool and watch movies in the lower level rec room, escape to a wonderful master bedroom suite. There is plenty of room for guests to come stay, laundry to be done on main floor and life to be lived at its fullest! Main floor features gas fireplace in living room, half bathroom, main floor laundry room and beautiful entry way. Large kitchen has a breakfast bar and all the storage you could hope for plus a dining area that opens to the back deck through large sliding door. You can use the den off the dining room for more space when entertaining during the holidays or as a reading room or main office area (great for a play room for small kids too!). The master bedroom suite is amazing with two walk in closets and a spacious bathroom with a separate shower, soaking tub, double vanity and gorgeous views. Lower level family room offers another fireplace and huge egress windows that takes away the basement feel and offers light and a lot of space to play or work or provide for guests. Added bonuses: full bath in the basement with shower and another play area room that has been turned into the best secret hideout a kid could dream of. 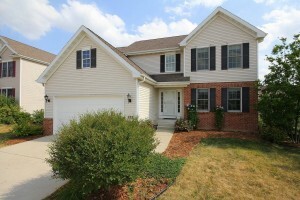 3 BR, 3.5 BA, 2796 Sq Ft.
Minutes to downtown Verona for convenient local shopping and schools. Walking distance to Badger Prairie Park, Reddan Soccer Park and several other community parks, and close to Mammoth Bike Trail. Easy commute to west side of Madison, with on and off access to 18/151.